We are excited to announce the farmers selected for our fourth annual Bootstrap Blog series, which features young farmers and ranchers in their first or second year of running their own farm. Throughout the season, each Bootstrap Blogger will write about the highs and lows, glory moments and curveballs that come with farming. Farming is a capital-intensive business. Between 2000 and 2010, national farm values doubled, making it more difficult for beginning farmers to afford land, not to mention farm equipment, animals, feed, or seeds. In a 2011 NYFC survey, 78% of respondents said they struggled with a lack of capital. Farming is also a knowledge-intensive business. Farmers are called on to be soil scientists, engineers, veterinarians, business managers, and marketing gurus—sometimes all in the same day. To keep their businesses afloat, young farmers must respond quickly to changes in climate, new marketing opportunities, and evolving technology. The Bootstrap series will be a weekly feature on our blog for the rest of 2015. The writers will share what it’s like to be a new farmer, how they plan their businesses, what their dreams are, and how they tackle one of the world’s dirtiest, most challenging, and most rewarding professions. 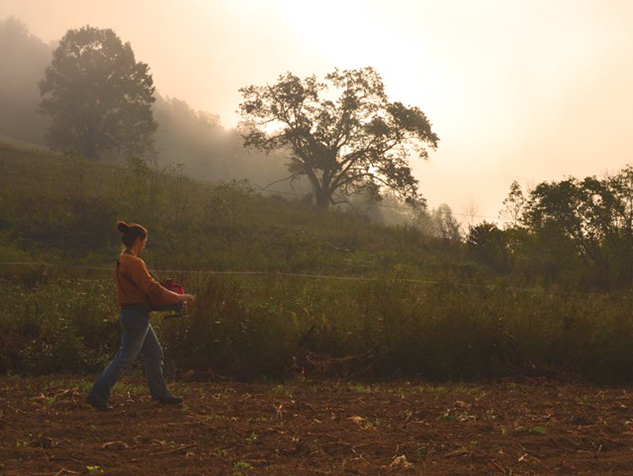 Photo: Maggie Bowling planting a cover crop at Old Homeplace Farm.